Hiker Happy Hour at Parkway on April 18: drink beer, support Bent Mountain community! Happy Hiker Hour is moving outdoors to Parkway Brewery in April! 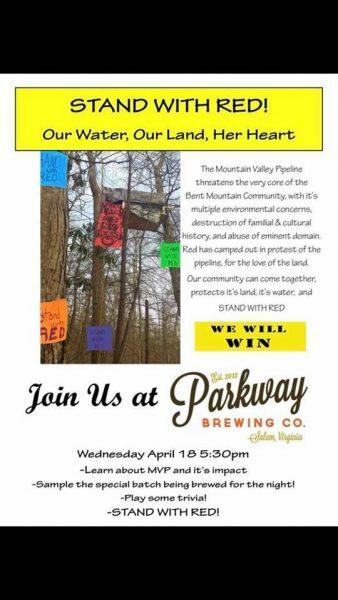 The Bent Mountain community in Roanoke County, concerned about its land and water, is teaming up with Parkway Brewery on April 18, 2018 at 5:30 to enjoy a special brew, with all sales proceeds going to benefit the community in its struggle against Mountain Valley Pipeline. So RATC is moving Hiker Happy Hour outdoors and joining in. This will also be Trivia night at Parkway, so feel free to team up and play. Parkway’s General Manager has expressed concerns about the impact of the pipeline on the brewery’s water, which is drawn directly out of the Roanoke River by the City of Salem downstream from over 100 crossings of the the river’s tributaries on steep slopes where all the trees are being removed. This will unleash sediment that has been buried for many years.